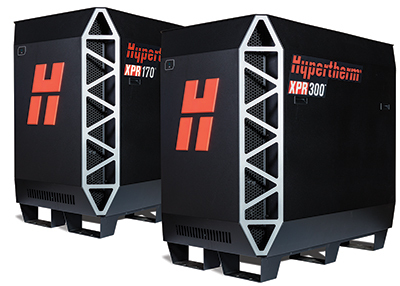 Hypertherm offers new consumable starter kits for its XPR X-Definition Plasma cutting systems, available with or without a torch for mild steel and nonferrous cutting applications. The kits include a variety of consumables to allow for cutting at different amperages, using all of the gas-process types supported by the XPR170 and XPR300 systems. The consumables contain several patent-pending technologies to improve consumable life and cut quality, according to company officials. Examples include Cool nozzle and Arc response technology, the latter of which protects consumables from the negative impact of ramp-down errors, a regular occurrence when cutting. By reducing the impact of ramp-down errors, XPR consumables reportedly can last as much as three times longer than those on older-generation systems. An EasyConnect feature allows operators to quickly plug the torch lead into the torch connect console without the use of tools, while a patent-pending QuickLock electrode delivers simple quarter-turn tightening to further reduce setup time. Another new design feature: a quick-change torch that enables an operator to rapidly change torches with one hand.